Today I’m going to stray a bit from the general theme of this blog and share a recipe for a Breadless Tuna Salad “Sandwich”. While I can’t claim that it’s a family favorite yet, it is part of a new project I have which continues the theme of helping people put good food on their table. Starting in April I’m going to be teaching some classes at a local Senior Guidance Center that provides free Health and Wellness support to the community. The theme for my first class is recipe make-overs. 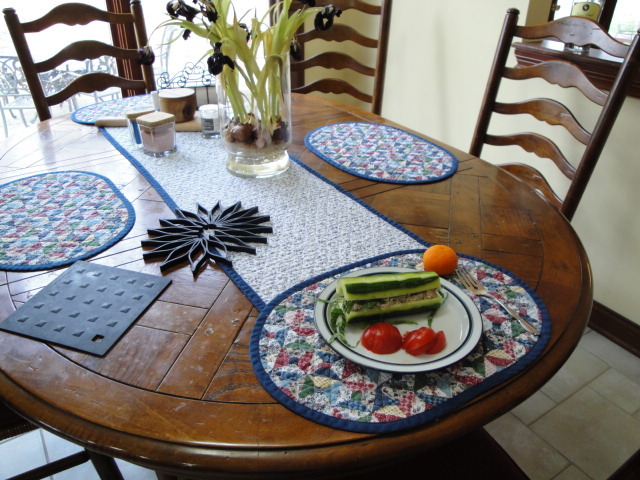 I’m choosing the classic Tuna Salad Sandwich as the recipe to tweak in the direction of lowering the fat, sodium and carbohydrate and at the same time keeping the omega-3 fat from the tuna and adding and a nice serving of vegetable in the form of cucumber and other green stuff. I think it’s a nice switch from the rather bland classic tuna salad sandwiches and will be a perfect fit for those hot summer days that must be just around the corner. It will also provide a great outlet for the abundance of cucumbers that I usually have in my front yard garden plot. Most of the ingredients are pantry and refrigerator staples. Today I’m substituting shallot for the green onion/scallion in the recipe because it was what I had on hand. The same goes for the dill component, dried dill weed will stand in for fresh until I have some in my garden. You could substitute some dill relish or dill pickle etc. but this will increase the sodium content. So if your watching your sodium intake stick with the herb or leave out any added salt called for in the recipe. The best cucumbers for this recipe are the long English type that come wrapped in plastic in the grocery store. They have thin skins and are not waxed (that’s why they are wrapped in plastic). The also have fewer and smaller seeds than many cucumber varieties. When you can find locally grown cucumbers that have no wax coating they would be a great choice as well. Depending on your preference you can leave the peel on or peel stripes as I’ve done here. Scoop out the seeds (a grapefruit spoon is a great tool for this but any spoon will work) and poke some holes along the length of the cucumber. Because I don’t like to waste food, I’m saving the middles and the ends of the cucumbers to make some tzatziki for another meal! You’ll find a recipe for tzatziki on this site in the Lamb and Goat section, but this one will be a more simple version with just a little salt, garlic and Greek yogurt. Whisk the vinegar, mustard, salt and pepper together and then slowly drizzle in the olive oil while whisking constantly to form the vinaigrette. Lightly brush the cucumber quarters with the vinaigrette. 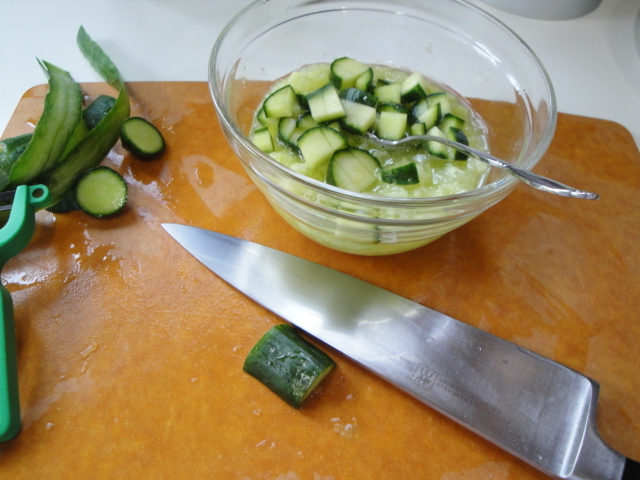 Those holes you poked in earlier will help the cucumber absorb the dressing. Add all of the above to the vinaigrette bowl along with the dill, yogurt, mayonnaise and some black pepper and optional salt (no more than 1/4 tsp. but I left it out entirely). Stir to blend. There are many choices in canned tuna. For the most omega-3’s choose tuna canned in water rather than oil. Today I’m using one can of white albacore and one of chunk light. These happen to both be 7 oz. cans rather than the 5 oz. cans specified in the original recipe. I didn’t find that the extra 4 oz. of tuna made the salad too dry but it will alter the nutritional profile. Now for a little finely shredded lettuce which is standing in for the sprouts today. I love fresh sprouts (alfalfa,spicy mix, onion etc.) but they have a short shelf life so I usually don’t have them on hand. I do almost always have some sort of dark green leafy lettuce however. Today it’s baby romaine. And there you are, a breadless tuna salad “sandwich” with a side of tomato. I did find the sandwich a little fat to bite through, and ended up eating it as an open-faced “sandwich”. I didn’t miss the bread or extra mayonnaise at all. 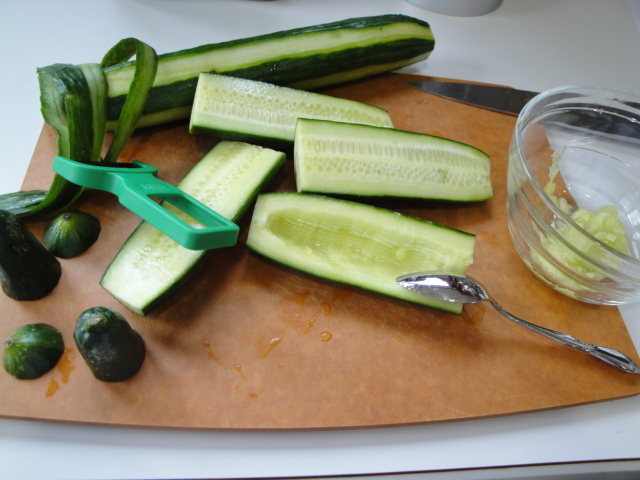 Halve the cucumbers crosswise and lengthwise. Use a spoon to scoop out the seeds and some of the flesh to make a boat shape. 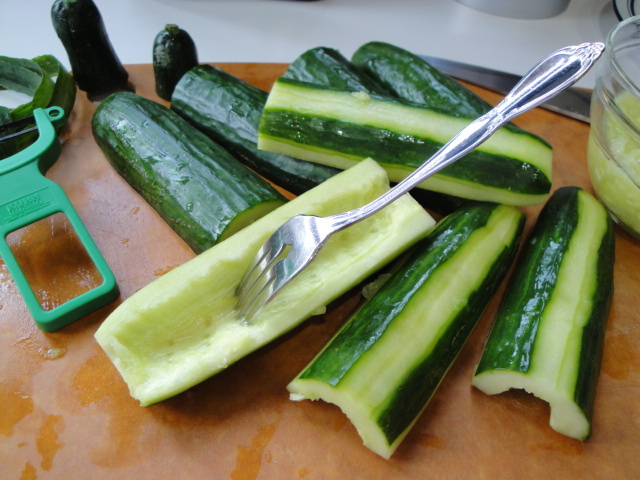 Poke the inside of the hollowed out cucumber several times with a fork. In a medium bowl, whisk together the vinegar, mustard, 1/8 tsp. of salt and a few grinds or a pinch of pepper. Slowly drizzle in the olive oil, whisking constantly until well blended. Brush the inside of the cucumber boats with some of the vinaigrette. Reserve the extra vinaigrette for making the filling. Add the onion or shallot or chives to the remaining vinaigrette and stir to combine. 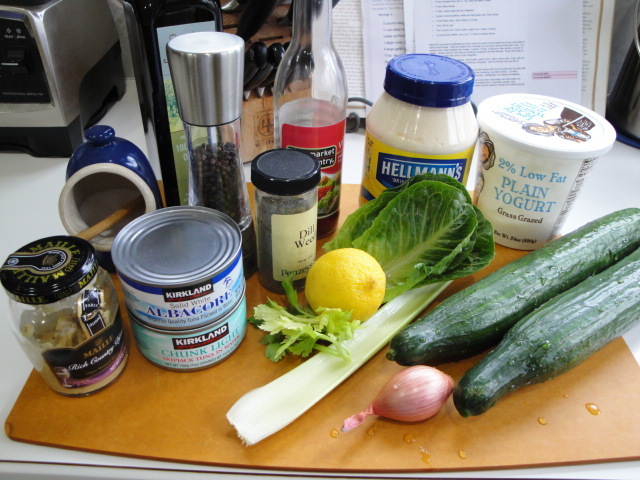 Stir in the yogurt, dill, celery leaves, mayonnaise, celery, lemon zest, ¼ tsp. salt (optional) and a bit of pepper into the bowl with the vinaigrette and onion. Add the drained tuna and stir to combine. To assemble the sandwiches, fill four of the cucumber quarters with the tuna salad and top each with ¼ cup sprouts or lettuce. Top each with one of the remaining cucumber quarters. Wrap each sandwich in wax paper or plastic wrap and refrigerate if not eating immediately. * Note that fresh sprouts are highly perishable and have been associated with salmonella and other food borne-illness. They should only be purchased from a reputable supplier, kept refrigerated and used promptly. People with weak immune systems, should avoid eating sprouts. Drain the tuna in a strainer in the sink. Chop the celery to measure 1/2 cup. Peel and chop the onion to measure 1/4 cup. In a medium bowl, mix the tuna, celery, onion, mayonnaise, lemon juice, salt and pepper. Spread tuna mixture on 4 bread slices. Top with remaining bread slices.